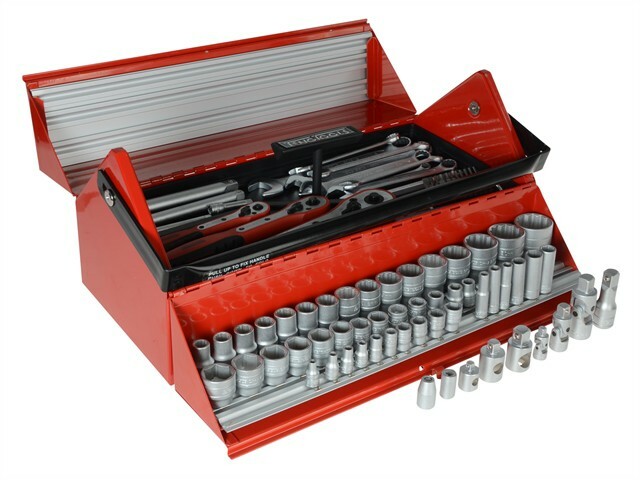 This Teng Tools large Mega Rosso mechanics tool kit comprises 187 pieces including 1/4 inch, 3/8 inch and 1/2 inch drive socket sets and combination spanners. They are all supplied in a barn style box with unique socket storage. Each tool is made from high-quality materials to ensure a long working life. 10 x 1/4in drive regular 6 point sockets: 4-13mm. 6 x 1/4 inch drive deep 6 point sockets: 6-13mm. 14 x 3/8 inch drive regular 6 point sockets: 8-22mm. 16 x 1/2inch drive regular Bi-Hex sockets: 10-32mm. 7 x 1/4 inch Hex bits: 3mm, 4mm, 5mm, 6mm, 7mm, 8mm and 10mm. 2 x 1/4 inch Pozidriv bits: PZ1 and PZ2. 2 x 1/4 inch Phillips bits: PH1 and PH2. 3 x 1/4 inch slotted bits: 4mm, 5.5mm and 7mm. 30 x 1/4 inch socket clips. 1 x 2 inch extension. 1 x 4 inch extension. 1 x 3/8 inch female to 1/4 inch male adaptor. 1 x 6 inch Extension bar (150mm). 1 x 3/8 Step up adaptor 1/2in. 1 x 2.1/2inch extension (75mm). 1 x 6 inch extension (150mm). 1 x 1/2Reduction adaptor (3/8 inch). 9 x Combination spanners (8-19mm). 3 x Hex keys (1.5, 2 and 2.5mm).